In light of the current crises of the Anglican Communion, this study of the origins of Reformation Anglicanism is particularly timely. The authors remind us why the Church of England adopted the confessional formularies that have characterized it since the sixteenth century and examine the relevance of these to the modern situation at home and abroad. Everyone with an interest in Anglicanism will benefit from looking afresh at its core principles, and the authors of this volume have done their best to demonstrate how those principles are still meaningful and relevant today. This book sketches some of the Church of England’s complex history from early beginnings to the shape of the present worldwide denomination, now about eighty million strong. 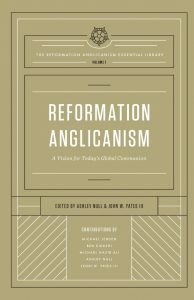 More importantly, it calls contemporary Anglicans, often awash in doctrinal and moral confusion, to return to the primary sources and evangelical and Reformed doctrines of the English Reformation, if that Reformation is to fulfill its promise. This wonderful book reminds me of what the former archbishop of Canterbury Michael Ramsey said: ‘To belittle the witness of the Reformers is to miss something of the meaning of the church of God.’ I am so grateful to the authors for producing this book, which will help us to know what it means to be a church of God.